Manufacturer of a wide range of products which include carbide end mills. With our immense expertise in the concerned domain, we are offering our clients a wide assortment of Carbide End Mills. Due to its performance and high accuracy this is widely demanded in the industry, these carbide end mills are available in various specifications of our customers, and can be customized in various options. Also, these carbide end mills can be purchased from us at competitive price. 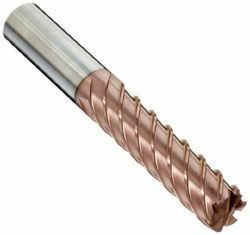 Looking for Carbide End Mills ?